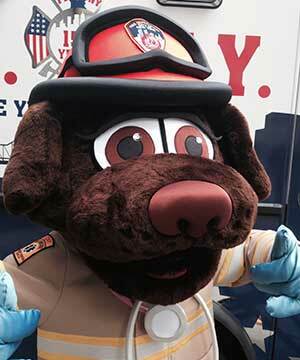 I’m Hot Dog, the official safety mascot of the FDNY. I’m a full-grown Dalmatian dog and I’ve been a Firefighter in this great City since I was just a young pup! Like most Dalmatians, I am smart, strong and loyal. My ancestors have a long history with the Fire Department. They used to run in front of fire apparatus, when the equipment was horse-drawn. And, many of my relatives lived in the firehouses to keep the horses company and protect the firehouses. Today, fire apparatus are not pulled by horses, so now it’s my job to teach people of all ages about fire safety and what to do in case of a fire. I provide educational materials and entertaining tips on fire and burn safety to children in classrooms, online and at special events throughout the City. 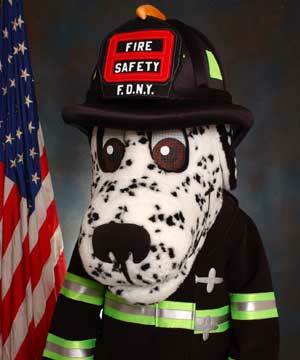 My name is Siren and I am the official life safety mascot of the FDNY. I'm a full-grown Labrador and I've been an EMT in NYC since I was just a little puppy! Like most Labradors, I am very smart and friendly. I provide New Yorkers with life safety tips to keep everyone healthy and safe. For more information about the FDNY’s life safety tips, you can always check out www.fdnysmart.org. And don’t forget to follow me on Twitter here! Find us on Twitter and Instagram!